The Vatican’s Papal Conclave: Hey, I Was There! – Travel. Garden. Eat. 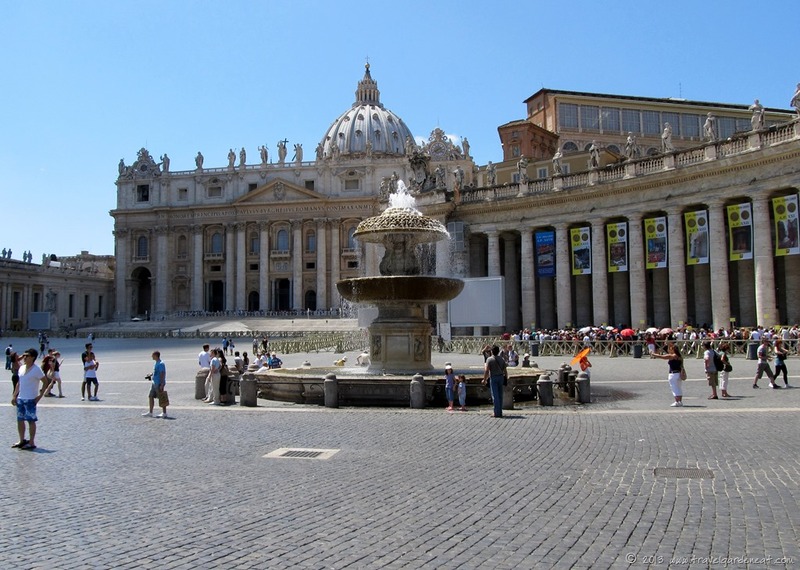 The Vatican’s Papal Conclave: Hey, I Was There! Reading the news reports about the recent conclave in the Vatican to elect the new pope, it was amazing to see the cardinals gathered in St. Peter’s for the pre-conclave mass before they entered the Sistine Chapel to begin their secret deliberations, and recall that we had stood in that sacred space the summer before last. 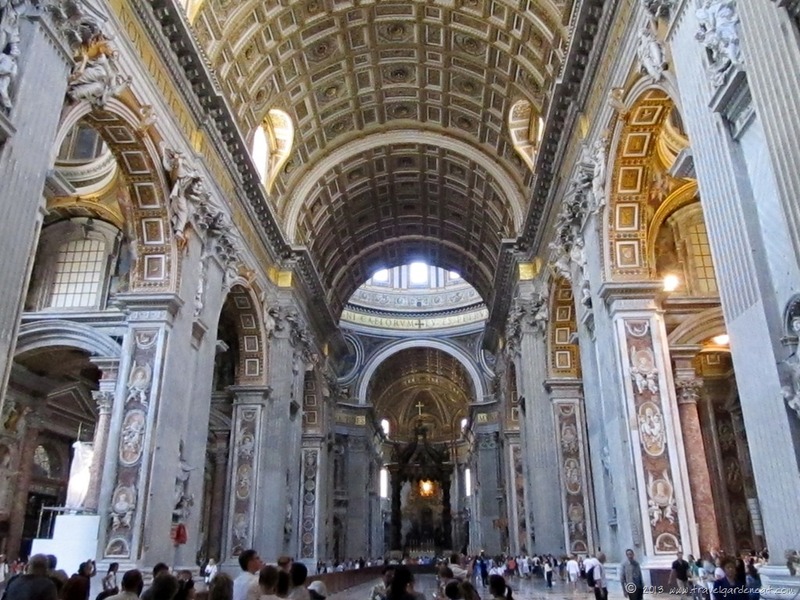 St. Peter’s Basilica may not be as breathtaking from the outside when compared with other well-known cathedrals . . .
. . . but, the interior of the Basilica is indescribably beautiful. Before traveling to Italy, I read Irving Stone’s The Agony and the Ecstasy, which recounts the life of Michelangelo and paints a vivid picture of the Italian artisan culture during the late 1400’s and early 1500’s. 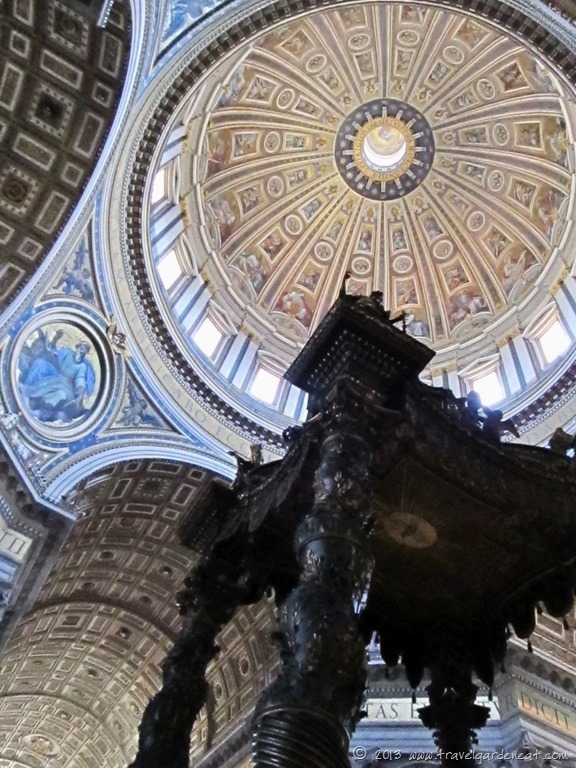 Michelangelo was 72 years old when he took over as the architect of St. Peter’s and left his mark through the design of the massive dome that acts as a beacon from so many vantage points throughout Rome. Michelangelo is often best-known for his sculptures, and one of his most memorable pieces, the Pieta, is safely preserved behind bullet-proof glass in St. Peter’s after a mentally-disturbed man attacked the work of art in the 1970’s. 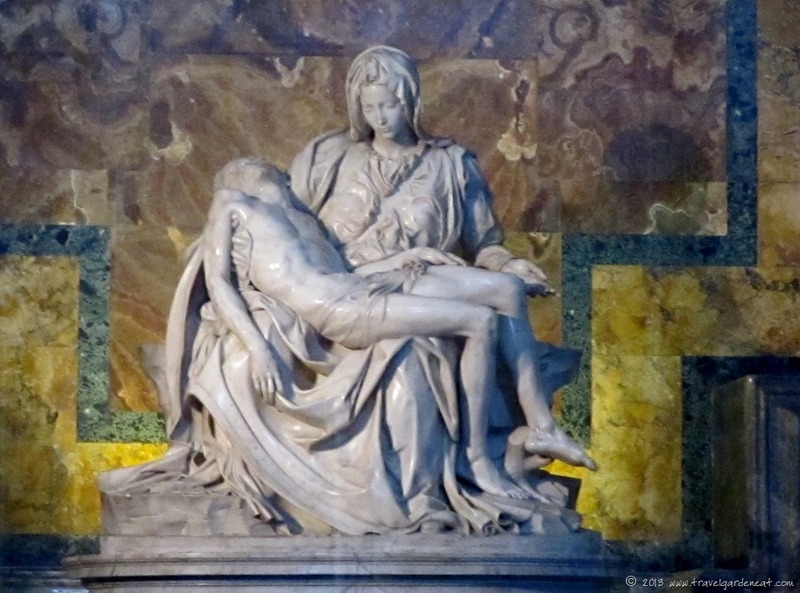 Michelangelo’s Pieta is a remarkable representation of Michelangelo’s love of the human body, and his talent for teasing the most delicate sculptures from large blocks of marble. It is truly exquisite and moving. Reading the fictionalized biography of Michelangelo, I appreciated the grueling conditions under which he worked to create one of the most spectacular pieces of art ever completed — the ceiling of the Vatican’s Sistine Chapel. I complied with the “no photos” rule in the Sistine Chapel, and so have none to share with you here. Some day I will have to write a post about one of my biggest travel pet peeves — travelers who disregard the rules and subject the rest of us to things like security guards loudly “shushing”, admonishing “no photos, no photos”, and disturbing what should be a wonderfully reflective moment of admiring the incredible work of Michelangelo spread across the ceiling of the Chapel. But, I digress. . . . back to St. Peter’s. Wandering the vast interior of St. Peter’s, I found myself often looking up to take in the layers of sculpture, painting, carving, and architecture. The view of St. Peter’s Square (Piazza San Pietro) from the top of the steps of the Basilica was surreal, as if it were a postcard or a movie set backdrop. As we descended the steps to walk across the Square and leave the Vatican, I knew our half-day visit had not done this venue justice. For a moment I thought you were there for the previous conclave! 🙂 beautiful shots Kat! Ha! That would have been quite the visit! Amazing to think of the stories these old walls could tell, of people from all walks of life . . . 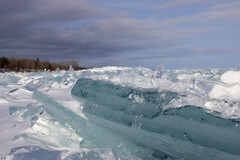 I was also recently there! 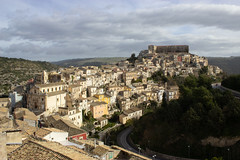 It is such a beautiful place, right? Hey, how was the line to get in? I was one of those people who waited so long that I got confrontational with people who tried to cut in line in front of me! Fortunately, we had timed tour tickets through one of the Vatican’s general tours before shuffling through like the masses of people. Did allow us to essentially walk in, and the tour was a great overview for a first-time visitor. Otherwise, that place could be so overwhelming that had we toured on our own we may still have been wandering in the Hall of Maps trying to take it all in! How nice to see some of these “inside” pictures! 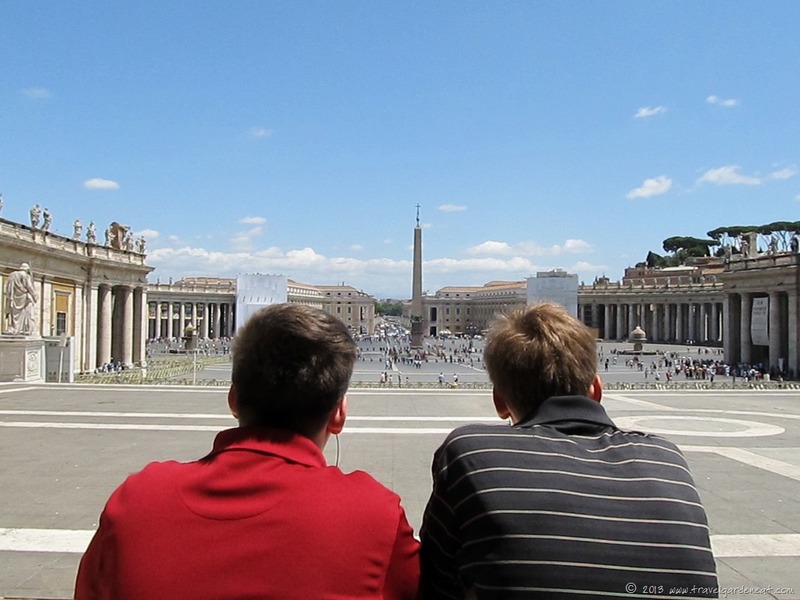 My daughter and I were in Rome maybe five years ago but we simply enjoyed the view from the outside. It all looks so familiar… I remember it was a hot day when we visited and our feet were weary, weary after walking 10 miles through Rome. What a delightful post, Kat! A gift for the eyes and mind! It was an amazing visit. Thanks, L.
Great corollary to reading a book more than once — so true! Pingback: Weekly Photo Challenge: Masterpiece | Travel. Garden. Eat. 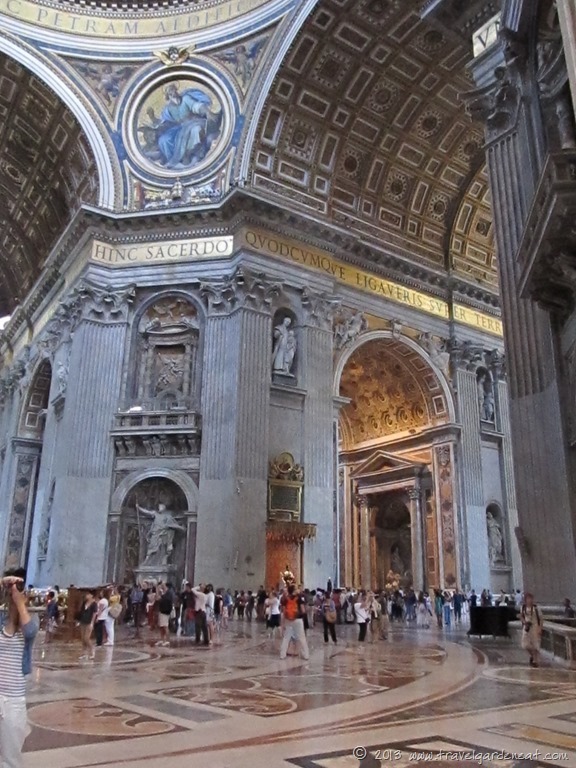 I was also at St. Peters Basilica, and when I was at the Sistine Chapel I observed the no picture rule. Yet, every other person was snapping pictures. I wonder if I did the right thing. I think I did, because one can easily obtain a photo of the Sistine Chapel online. As for the other people, it’s disappointing that people ignore these rules, as constant flashes can contribute to the deterioration of the artwork and colors. You definitely did the right thing, Kathleen!